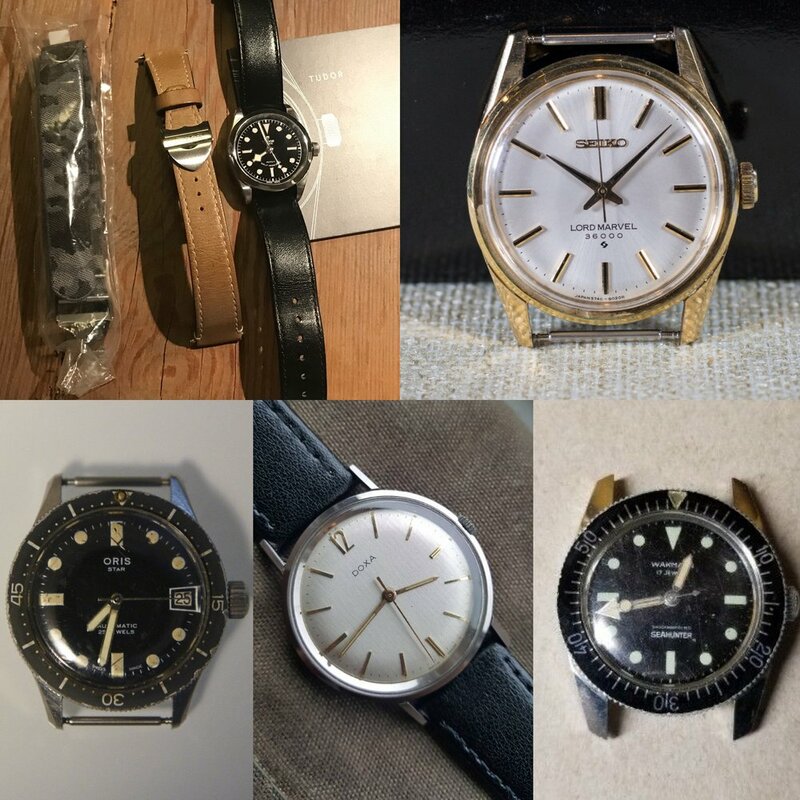 For those that are new to meticulist.net, #thesubregister is a roundup of interesting watches for sale or recently sold. I try and go beyond the known dealers and the usual suspects, and try and have suggestions for budgets and collectors of all levels. Kicking things off for 2019, here are some watches that have recently caught my eye. This one is so clean and simple, and for the price, I’m not sure it gets much better. Photo from FS listing on WatchUseek forums, click through to buy. 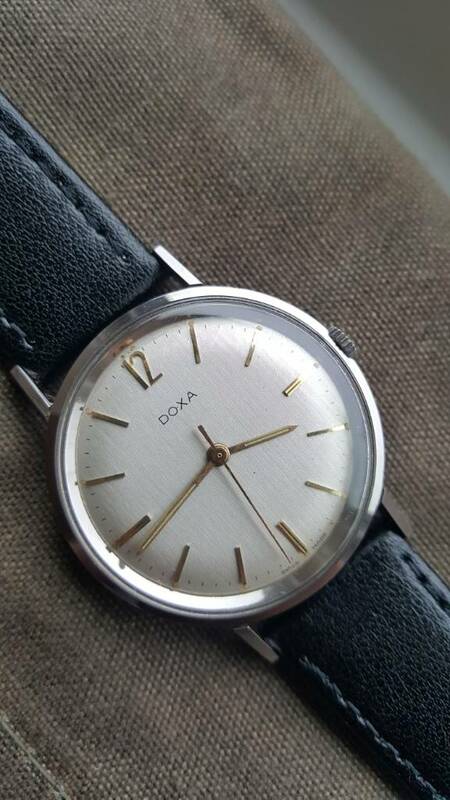 Starting things off nice and easy with this sort of linen dial, clean and simple, manual wind vintage Doxa. I don’t know that there’s much to say here other than, this is an attractive, simple vintage watch with a solid name for less than a lot of straps. The caseback is particularly interesting and it appears that this one will wear extremely slim. The long, sharp lugs will help it wear larger than its 34mm diameter, and hey, it’s only $60. Listed on WatchUseek forums here. I love me some thick, plentiful tritium lume and this one’s got it for days, plus look at that case! Photo from eBay listing, click through for more pics and to bid. Making its second #thesubregister appearance, is an Oris Star diver. I have to say this one is more attractive than the last, and it is super sharp and really has everything you could want in a vintage dive watch with a prominent dive watch brand, loads of thick lume, great bezel, and big, chunky compressor crown. Said to be from the original owner’s family, the facets on the lugs appear to be razor sharp, and the movement looks pretty clean and unmolested overall as well. Currently sitting at $399 on eBay here. Someone needs to buy and enjoy this so I don’t! Photo from seller’s listing, click through for more info. I try to approach all of my recommendations on #thesubregister asking if I would buy it myself. Even if it’s not my style, I still try to think of it from a condition and price standpoint. Well, this one I almost did buy, and still may. The Lord Marvel has long been on my list of vintage Seikos I’m fond of because of it’s clean crisp lines, lack of date, and that dreamy hi-beat manually wound movement. I love that these have most of what make vintage King and Grand Seiko watches so great with applied logos and numerals, sharp hands, and clean layouts but still manage to fly pretty low on the price radar. I also rather like that the cases tend to have a bit more traditional long lugs, versus some of the flatter/fatter trademark KS and GS designs. These lugs actually sort of remind me in a way of 1960’s Heuer Carreras with the sharp facets and angles. And the movements, these manually wound hi beat movements are so great to wind, set, and watch glide around the dial, can you tell I really like this one? I typically shy away from plated metals, but the gold plating on this one has a nice charming wear to it, and is said to not have any flaking or chipping. This is such a charming, vintage watch, and I think the gold tone just adds to that. Plus, at $250 asking and taking offers, it’s tough to think of a better buy in vintage for the money. Find it on WatchUseek forums from a reputable seller here. Photo courtesy of eBay listing, click through to bid. Here’s this week’s chance or wildcard. I stumbled upon this very random reference I have not seen before, but given the era, wouldn’t totally surprise me. The wildcard is that that pictures are so bad, you can’t really tell if it’s a redial. The font sort of makes me think it might be, but given the myriad of fonts Wakmann used in the 1960’s and 70’s, I wouldn’t be surprised if it was legit. The well worn crystal, clean dial and hands, and very thick, sharp case makes me think it’s original and honest. It wouldn’t be uncommon, especially for the lower price point watches of this era to have a dial and hands with different lume and non-matching since they may have come from different manufacturers. But, the uniformity of the both the dial and the hands separately, make me think it’s original, and just look at that funky arrow minute hand and the big ole lollipop seconds!!! Being that it’s only sitting at $127 right now, I’m thinking it might be one to roll the dice on. See it on eBay here. Full kit, extra strap, and at entry level or indie brand pricing, this is really tough to be beat. It’s more in line with what the modern Rolex Explorer should be. Click through for the full listing. This last one is kind of a freebie and certainly not news to anyone interested in the BB36. I post it because it’s crazy to me how overlooked or underappreciated this watch is for the money. Although I would generally prefer it on bracelet, if you’re not a metal type, this might be a great opportunity. This seller looks motivated and has it priced on WatchUseek forums at $1650 + shipping, with plenty of bumps. I’ve seen a few of these go for around $1750 - $1800 on bracelet recently, and that’s awesome for anyone that’s in the market. For independent or a lesser mark money, you’re getting Tudor build quality with the ease of reliability and maintenance of an ETA movement in a fantastic package. I feel like this is the ultimate modern or poor man’s Explorer, with much of the same no-date aesthetic, clean dial, and absolutely perfect 36mm case. I critiqued this watch for lacking a rotating bezel when it debuted, but when comparing it to a 14270 Explorer, instead of a dive watch, it makes a lot more sense… for a lot less money. That’s it for this week, thanks for reading. As always, if you have any questions or come across something interesting in the wild, please feel free to DM or tag me on social media, or contact me here.